There is a big fuss about lemon water nowadays. It is like that since drinking lemon water every morning on an empty stomach is beneficial for your overall health in many different ways. This is a simple, but incredibly beneficial drink. It comes with a high content of volatile oils, flavonoids, carbs, antioxidants, potassium, vitamin C, protein, phosphorous, vitamin B, etc. This simple drink has potent antibacterial and antiviral properties, and it can boost your immunity. Also, this drink is great for combating infection, thanks to its high content of vitamins, limonene, magnesium, citric acid, calcium, pectin, and bioflavonoids. That is why consuming this drink first thing in the morning can help prevent hunger cravings, help digestion, form an alkaline that balances the Ph levels of the body, detoxify the system, and boost weight loss. It is said that consuming lemon water every single morning can help you deal with some health problems. Lemons contain citric acid which helps prevent the formation of calcium kidney stones (1). Moreover, lemon has pectin, which helps prevent food cravings. On the other hand, lemon juice stimulates the bile production and helps digestion, needed for decomposing the food throughout the digestive process. Lemons can help balance acidity thanks to the alkaline byproducts they produce when metabolized (3). This, in turn, helps reduce and prevent inflammation. A study shows that a combination of fish oil omega-3s with lemon extract helps relieve joint pain and discomfort (4). Even though the study was conducted on animals, you have nothing to lose for trying it out. Mixing water with small amounts of lemon juice can help relieve acid reflux (5). However, drinking plenty of lemon water can have the opposite effects. Lemons contain plenty of vitamin C which reduces the risk of dry skin and wrinkles (6). So, drinking lemon water regularly will improve your skin quality. Lemon water can help prevent white spots and strengthen your nails. Colitis occurs due to an imbalance in the alkaline/acid levels of the body. So, consuming one glass of lemon water on a daily basis could balance the pH levels and lower acidity. Still, there are no studies that can prove this effect of lemon water. This drink is useful for preventing food poisoning thanks to lemon’s antibacterial properties. It is said that consuming lemon water helps ease the pain triggered by gallbladder stones. Lemon water helps boost the immunity, thus helping to get rid of pathogens found in the body. Lemons are abundant in vitamin C, and therefore they come with potent antibacterial and antiviral properties and also boost the immunity. 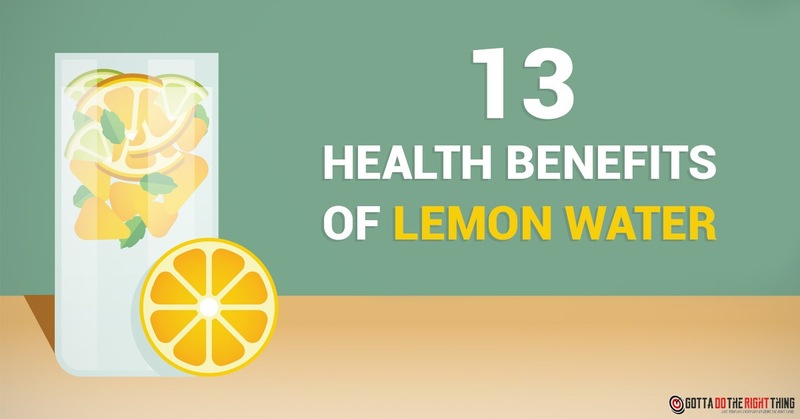 That is why lemon water can help treat and prevent common colds and flu. Lemon water can make your teeth whiter than before, and combining it with some baking soda will make an excellent natural paste for teeth whitening (7).